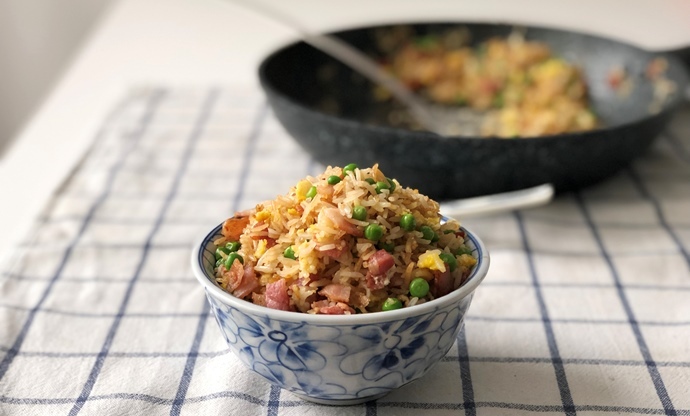 Shu Han Lee shares her top tips to achieve perfect fried rice at home, before showcasing how versatile the dish can be with three deliciously simple recipes that make the grains the star of the show. Fried rice is a quick, easy, and tasty way to make a meal out of leftover rice (always common in Asian households) and the sorry bits of vegetables lying around in your fridge at the end of the week. But I love the dish so much I always cook extra rice. 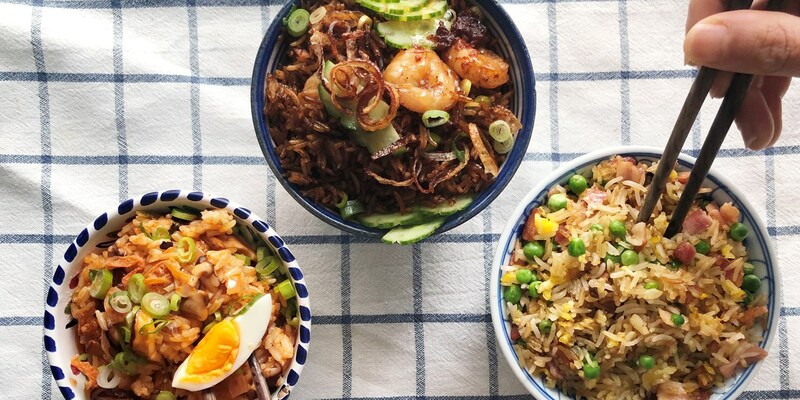 The versatility and popularity of the dish across Asia means there are tons of possibilities when it comes to fried rice; you can change it up simply through your choice of sauces, seasonings and aromatic ingredients. Combine fragrant ginger and toasted sesame oil for the classic egg fried rice; throw in chopped kimchi for a hot and piquant Korean version or add fiery sambal and sweet kecap manis for nasi goreng. You aren’t limited to the traditional repertoire of flavours; I often use bacon lardons to lend a rich, salty, smoky depth of flavour and an unashamedly British twist. Use leftover cold rice. Fresh rice is warm and moist and will clump together when it hits the hot pan. If you’re in a pinch, you could try sticking fresh rice into the freezer for ten minutes to cool it down quickly, then break up the grains with a fork. Don’t overcrowd your wok. You need enough space for the rice and ingredients to be spread out over the surface of the wok and tossed. Break up the clumps with the edge of your spatula to separate the grains as you cook it. Make sure your wok is smoking hot, especially when you tip the cold rice into the pan. This will make sure each grain is heated through properly and infused with a wonderful aroma as the grains fry. Nasi goreng is essentially the Malay word for fried rice. Kecap manis (a type of sweetened soy sauce) gives the dish its signature sweet flavour and helps the rice to caramelise. 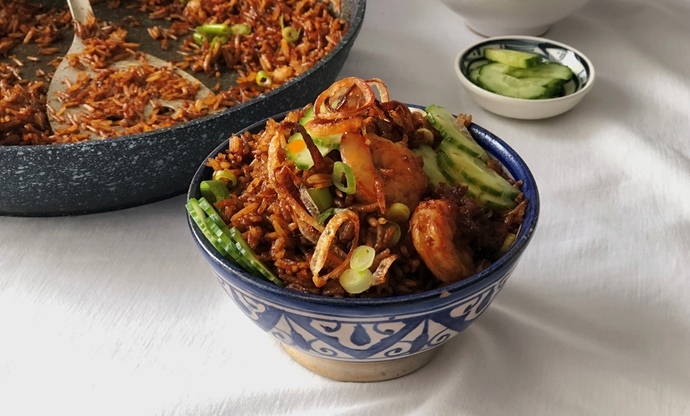 Sambal tumis (which can be found in most Asian supermarkets) is chilli paste that’s been slowly cooked, often with toasted shrimp paste, and adds wonderful depth of flavour and aroma to the dish. While tomato purée might look like an odd addition to the ingredients list, many Malay hawkers back home often add a sneaky dollop of it (or even ketchup) to the dish for extra sweetness and colour. I love mine served with prawns and crispy fried shallots, but feel free to change things up with your favourite vegetables, chicken or shredded omelette. 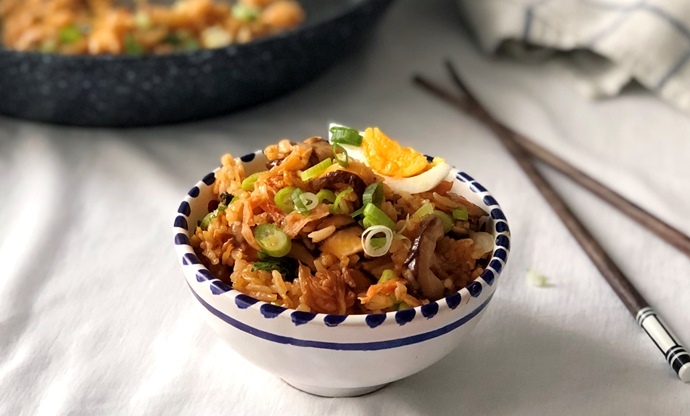 The secret to a good kimchi-fried rice is to use both the kimchi and its juices, so that you’re packing as much umami punch as possible into the dish. I like to separate the two, frying the kimchi so its edges caramelise and turn extremely fragrant, before using the kimchi juices to make a stir-fry sauce along with sweet sticky gochujang (Korean fermented hot pepper paste).